Chardin is represented in the Museum’s collection by three outstanding still lifes: the present pair, dating from 1728, and a still life with a pestle and mortar, pitcher and small copper cauldron or cooking pot, dating to some years later. The naturalist trend to which Chardin’s art can be ascribed co-existed in 18th-century France with the Rococo style. Objects are the protagonists of his paintings, which vary and change their role according to the composition and in relation to each other. It has been said that Chardin was the painter of the middle-classes, whom the artist represented in scenes with figures in the 1730s, in which these figures are surrounded by everyday objects that form part of their environment. Chardin’s still lifes are arranged with objects that belonged to him and which he repeatedly used in his compositions. Very few preparatory drawings are known, a fact that tallies with his unusual working methods. According to Mariette in his Abecedario, Chardin needed to have the model continually within sight from the first brushstrokes to the final touch. The same author also noted that Chardin sold his paintings for higher prices than other painters working in traditionally more prestigious genres such as figure painting. The present pair of canvases, which was in the collection of Baron Edmond de Rothschild, was acquired for the Thyssen-Bornemisza collection in 1986. The oldest known references to these canvases locates them in the collection of Rémond, ancien maître d’hôtel du roi, after which they were auctioned in 1778. They seem to have belonged to Armand-Frederic Nogaret and were auctioned in Paris in 1807. In the 19th century they were to be found in the collection of the Baron de Beunonville and were auctioned in 1881 and 1883. In the 20th century they belonged to Leon Michel-Levy then Baron Maurice and Baron Edmond de Rothschild. Both oils reflect the influence of Dutch painting that is evident in the artist’s early work, in which he adapted northern subjects and formats to his own manner. 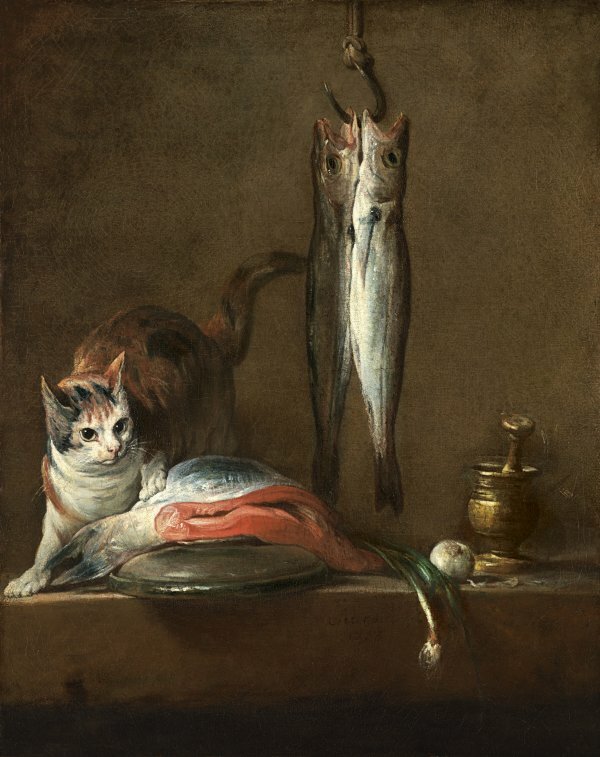 Still Life with Cat and Fish is signed and dated 1728, a date that was incorrectly read as 1758 in the literature prior to 1979 as it is difficult to decipher. On the occasion of the monographic exhibition on the artist held that year, Rosenberg and Caritt corrected the date to 1728, which is more appropriate to the style of the two canvases. On 25 September of that year Chardin was admitted to the Académie as a painter of fruit and animals. That period, during which he painted two of his masterpieces (The Rayfish of around 1725 and The Sideboard of 1728) and which is most clearly influenced by Dutch art, Chardin began to accompany his silent, motionless objects with living animals that interrupt the tranquillity of the scene. These two canvases with their simple compositions of a stone ledge on which the cats, foodstuffs and kitchen vessels are arranged, break their horizontal emphasis through fish hanging from hooks above them. The rich colouring, applied with a thickly charged brush and delicate touches of paint across the surface, creates a realistic, visually convincing representation. The chromatic range used in the fish scales and the cats’ fur would be admired by painters of the following generation such as Descamps. The spirit of these two works is different to that found in his famous Sideboard in which he replaces the cat with a dog and depicts a table with objects and exquisite foodstuffs. There are two versions with variants of the present pair in the Nelson-Atkins Museum of Art, Kansas and the Burrell Collection in Glasgow.